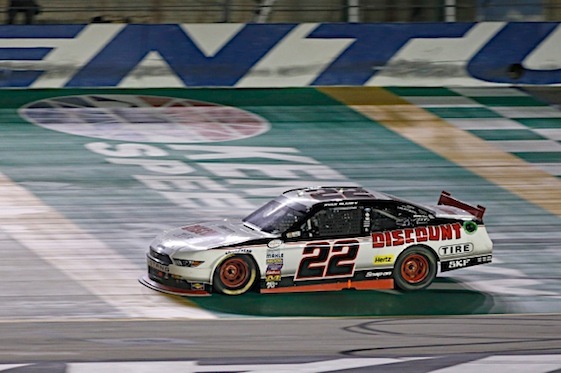 Ryan Blaney won his second NASCAR XFINITY Series race on Saturday night after he emerged from a green/white/checkered restart to capture the VisitMyrtleBeach.com 300 at Kentucky Speedway. Blaney was being challenged by Ty Dillon when a caution was called with four laps to go. On the final restart, Blaney, driving the No. 22 Ford of Team Penske, got an assist from Regan Smith of JR Motorsports and was able to drive away for the win. “We were just even with the 3 (Dillon), and the 7 (Smith) gave us a good push [on the final restart],” said Blaney who captured his fourth career XFINITY Series win. “Luckily we were able to get a good [push] and just get a little bit of position on the 3 to kind of use up the race track and get in front of him. I knew once we were clear we had a really good shot at it. Dillon was not a satisfied runner-up. Chris Buescher, who finished seventh, now leads Dillon by 19 points in the standings with six races remaining. Chase Elliott, who finished fourth, is third, 25 points out. (5) Ryan Blaney, Ford, 201, $85169. (4) Ty Dillon, Chevrolet, 201, $55180. (3) Regan Smith, Chevrolet, 201, $43973. (8) Chase Elliott, Chevrolet, 201, $36199. (22) Brandon Jones(i), Chevrolet, 201, $29266. (6) Brendan Gaughan, Chevrolet, 201, $27116. (9) Chris Buescher, Ford, 201, $28504. (10) Erik Jones(i), Toyota, 201, $25292. (14) Darrell Wallace Jr #, Ford, 201, $25664. (16) Matt Tifft(i), Toyota, 201, $25134. (12) Elliott Sadler, Ford, 201, $23783. (26) Ryan Sieg, Chevrolet, 201, $23353. (2) Brian Scott, Chevrolet, 201, $25398. (18) Dakoda Armstrong, Ford, 201, $22437. (13) JJ Yeley, Toyota, 201, $22650. (25) Cale Conley #, Toyota, 201, $22113. (27) Dylan Kwasniewski, Chevrolet, 201, $16206. (11) Ross Chastain #, Chevrolet, 201, $21875. (7) Jeremy Clements, Chevrolet, 200, $21761. (29) David Starr, Toyota, 199, $22137. (30) Joey Gase, Chevrolet, 197, $21531. (39) Martin Roy, Chevrolet, 197, $21425. (1) Daniel Suarez #, Toyota, 197, $24698. (36) Derrike Cope, Chevrolet, 195, $15167. (19) Ryan Reed, Ford, 195, $21210. (34) Carl Long, Toyota, 194, $14954. (38) Mike Harmon, Dodge, 192, $14847. (23) Ryan Truex, Ford, Accident, 187, $14741. (33) Eric McClure, Toyota, Accident, 174, $20615. (15) Ben Rhodes, Chevrolet, Accident, 167, $20809. (20) Dylan Lupton, Chevrolet, Accident, 118, $20402. (17) Brennan Poole, Chevrolet, Accident, 96, $20291. (35) Morgan Shepherd, Chevrolet, Suspension, 52, $14200. (28) Harrison Rhodes #, Chevrolet, Accident, 46, $20109. (32) TJ Bell(i), Toyota, Rear Gear, 27, $14012. (21) Michael Self, Chevrolet, Accident, 25, $18889. (37) Ryan Ellis(i), Chevrolet, Suspension, 16, $11889. (40) John Jackson, Jr., Dodge, Vibration, 12, $10889. (31) Jeff Green, Toyota, Vibration, 3, $9889. (24) Blake Koch, Toyota, Accident, 2, $14889. Average Speed of Race Winner: 110.238 mph. Time of Race: 2 Hrs, 44 Mins, 06 Secs. Margin of Victory: 0.519 Seconds. Caution Flags: 10 for 55 laps. Lap Leaders: D. Suarez # 0; B. Scott 1-28; T. Dillon 29-32; D. Wallace Jr # 33; T. Dillon 34-54; R. Blaney 55-84; T. Dillon 85-87; D. Suarez # 88; E. Jones(i) 89-94; B. Scott 95-111; B. Jones(i) 112-127; R. Blaney 128-152; T. Dillon 153-161; E. Jones(i) 162-168; D. Suarez # 169; R. Blaney 170-192; T. Dillon 193-198; R. Blaney 199-201. Leaders Summary (Driver, Times Lead, Laps Led): R. Blaney 4 times for 81 laps; B. Scott 2 times for 45 laps; T. Dillon 5 times for 43 laps; B. Jones(i) 1 time for 16 laps; E. Jones(i) 2 times for 13 laps; D. Suarez # 2 times for 2 laps; D. Wallace Jr # 1 time for 1 lap. Top 10 in Points: C. Buescher – 982; T. Dillon – 963; C. Elliott – 957; R. Smith – 935; D. Wallace Jr # – 874; E. Sadler – 872; B. Scott – 857; D. Suarez # – 852; B. Gaughan – 836; R. Reed – 735.